Chuck Swindoll's Paws & Tales: God Cares for You is a 50 minute animated movie that takes the favourite characters from the radio program and brings them to "life" on the screen. 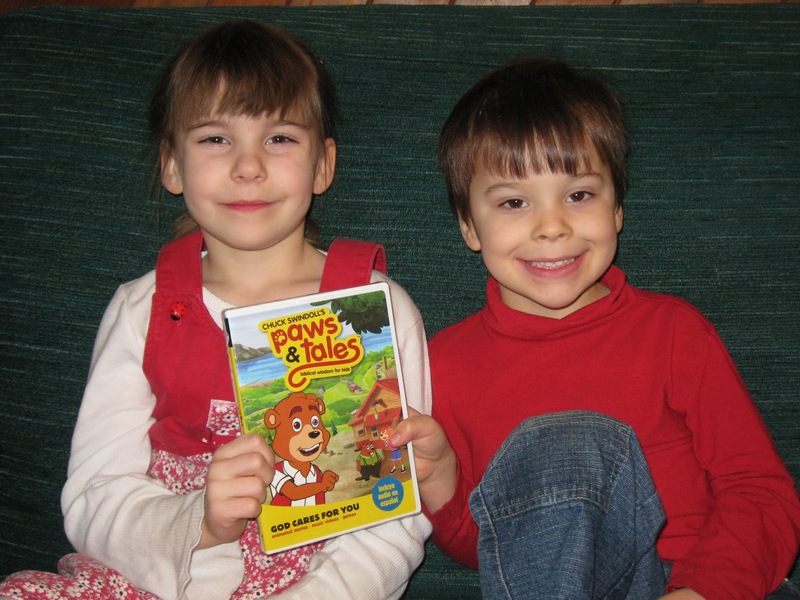 My children and I have listened to the Paws and Tales radio program before, but it was easy to forget that the characters were animals. Seeing the characters in cartoon form was an entirely different experience. In the episode "The Good Shepherd", CJ and his beaver friend, Ned, take care of a shepherd's flock only to find that it isn't as easy as they thought it would be. This episode is a bit scary if you have kids who scare easily. Mine were both fine, but the threat of wolves wanting to attack the sheep could be too much for super sensitive little ones. In "A Good Foundation" the kids set out to build a clubhouse, but they have different ideas about how that should be done. The kids divide into two groups and throw all wise counsel aside as each group attempts to build the best clubhouse. At the end of each episode there is a song and music video that ties in with the theme of the episode. The song after "A Good Foundation" was very sweet and uplifting. The song after "The Good Shepherd" highlights CJ's bad attitude at first and includes the word "dumb", but after his attitude takes a turn for the better, so does the song. The dvd contains bonus features such as activity sheets and teaching resources as well as a version of the movie with Spanish audio. Elijah: "God is always with you. He will never, ever quit being your Shepherd"
Desiree: "I learned that in tree language "creeeeeek" means get away. I'm going to fall on you." Elijah: "I liked the part where the lamb was running around. It was funny. Desiree: "I liked when little, cute Oscar the lamb came"
Would you like to watch the rest of the movies in the series? 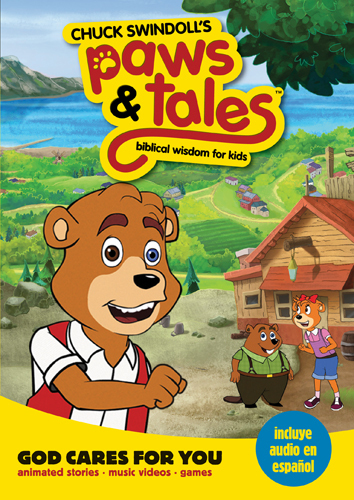 D: "I think Staci the girl bear"
This dvd teaches Biblical truths in a way that's easy for kids to understand while also being funny and memorable. A couple of days after watching it Elijah said "I know that the rock they were talking about isn't really about a rock -- it's about God." I love that he was able to grasp the deeper meaning and that he was still thinking about it days later. Check Out: Paws and Tales Games for more fun and Tyndale House Publishers for more information. Buy It: You can order Paws and Tales Products online or purchase them through your local Christian bookstore. Tell me a favourite Bible story (or any story!) that your child/children love. Disclosure: Tyndale provided me with a copy of Paws & Tales: God Cares for You to review in exchange for my honest opinion. My granddaughter loves the story of the 7 loaves of bread, we are teaching share with those in need. We have one 2yr.old son and he like to hear the story of Noah a lot so I think that is his favorite. I like you on FB as Whitney Lett. I like and left a comment on Paws & Tales FB page as Whitney Lett. My son is still all interested in birth of baby Jesus. My kids love the story of the 5 loaves and 2 fishes. We love all the Dr. Seuss stories, especially Green Eggs and Ham. I'm sorry if something shows up twice on here. Blogger is going crazy on me for some reason. Lol. It's not intentional. Also like Paws and Tales on FB and wrote on their wall. Follow you on twitter too and tweeted.